Flow Assisted Susceptibility Testing (FAST) for rapid antibiotic resistance testing (School of Pathology and Laboratory Medicine). 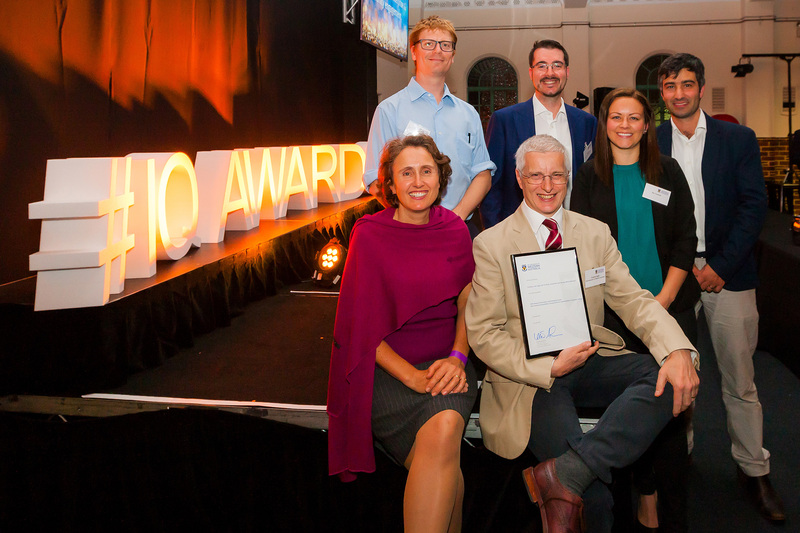 The Research Innovation and Enterprise Award recognises a UWA researcher who has applied learnings from their scholarship to develop an innovation solution to a real-world problem. It seeks to celebrate knowledge translation through research enterprise, entrepreneurship and/or industry engagement. Flow Assisted Susceptibility Testing (FAST) for rapid antibiotic resistance testing. Antibiotic resistant bacterial will result in the death of 250 million people by 2050. FAST Lab are using lasers and fluorescent dyes to test how efficient an antibiotic will be against bacteria, and they are achieving this 1-3 days faster than current techniques. This innovation allows patients to receive the most effective antibiotics very rapidly, which will limit the spread of antibiotic resistance and save lives. Professor Tim Inglis (School of Pathology and Laboratory Medicine), Kieran Mulroney, Jarrad Hall, Xiao Huang and Erin Turnbull. Josephine Muir; Mary Webberley; Xuhao Du; Gary Allwood; Andrisha Inderjeeth; and Barry Marshall. The Noisy Guts team has developed an acoustic belt that analyses rumbling tummies to help doctors screen and diagnose gut disorders. Their innovation uses sensing technology originally designed to pick up the sounds of termites! Camilla and Adrian are working to simplify complex legal agreements to make law and lawyers less alienating to members of our community, using illustrations and comic book panels to replace traditional contract clauses. Brendan Kennedy; David Sampson; and Christobel Saunders. This interdisciplinary team has developed a brand new imaging technique that maps the sense of touch onto a high resolution image. This innovation will allow surgeons to more accurately remove tumors during breast surgery. Peter has designed a simple dive computer that can be made out of found materials for impoverished diving communities in Asia and South America. His innovation has the potential to greatly reduce the incidence and severity of decompression sickness. In 2016, UWA scientists detected ripples in the fabric of space-time called gravitational waves, (which were predicted by Einstein 100 years earlier). Andrew applied these detection techniques to invent a powerful magnetic gradiometer which can detect minerals buried deep underground - while flying high above the ground in an airplane. Archaeologist, Jo McDonald, is of UWA’s pioneers in linking academia to industry. Her team are currently investigating Rio Tinto’s rock art-rich holdings in the Pilbara. 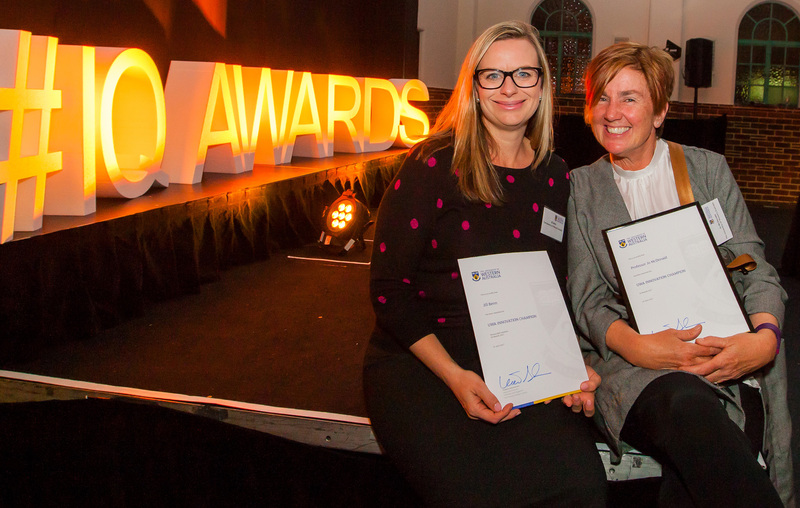 The UWA Innovation Champion Award recognises a researcher or staff member who has demonstrated a sustained commitment to promoting a culture of innovation, enterprise and industry engagement at UWA. Archaeologist, Jo McDonald, is of UWA's pioneers in linking academia to industry. Her team are currently investigating Rio Tinto's rock art-rich holdings in the Pilbara. Rock art is the oldest evidence for human communication. It lets us see what mattered to people many millennia ago. Together, UWA researchers, students and indigenous communities using cutting edge technology to help us understand the past including; Drones to map ancient landscapes, tablets to enable rapid and comprehensive archaeological site recording and management, photogrammetry and 3D printing. Jill is rethinking what UWA libraries should look like. She recently led a team to refurbish UWA’s Reid Library. UWA students were involved as co-designers, decision makers and promoters. The result? A radical departure from the traditional library concept. Rather than an emphasis on physical collections, the space has been repurposed to include a range of informal and collaborative learning spaces. Since opening in August 2016 there has been a 75% increase in Library use. The learnings are now being applied to other UWA Libraries. Adrian co-founded the UWA Makers, a community of students and staff interested in design, 3D printing, machining, electronics, and software. He recently established a pilot program to match students with academics to help tackle research problems – a radical knowledge-transfer paradigm-shift. Jeremy is working to bring the gap between research and industry through industry-sponsored research projects for UWA students. He is the Director of Cooperative Education for Enterprise Development (CEED). Since 2008 his team has initiated 200 CEED projects with over 50 different industry partners and across a range of faculties. Kevin works to support the growth of a thriving biotech industry in Western Australia as a leader, mentor, speaker and strategic adviser. His research has resulted in several patents, and he is Chief Scientific Advisor of Dimerix Limited (an ASX-listed spin-out company). Paul has introduced a range of innovative initiatives to UWA including the Indigenous Business, Enterprise and Corporations Conference (IBECC), WA’s first impact investing pitch event and the Social Impact Festival, which now attracts more than 5000 attendees. Tom Maclarin's MAE Swift unmanned aerial vehicle (UAV). 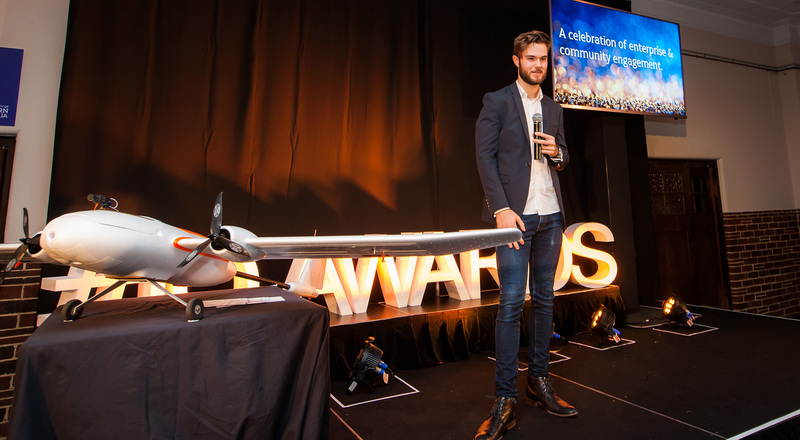 The Student Startup of the Year Award recognises and celebrates innovative enterprises launched by UWA student entrepreneurs. The MAE Swift UAV is a pilotless aerial vehicle, capable of flying five times higher than many drones currently on the market. The device can conduct aerial surveillance at a fraction of the cost of current piloted aircraft, and has various agricultural and surveillance applications. HUMM Tech’s goal is to expand human potential with wearable neurotechnology. They’re working with high performance cognitive athletes, to build a headset that measures and stimulates mental performance for competitive eSports. Mud & Musk creates DIY skincare products, which aims to make it easier to get in touch with natural ingredients, their history, and how they are sourced, ensuring that skincare can be accessible, affordable and ethical. Launched in 2016, the organisation supports sustainable and fair-trade practices when sourcing cosmetic ingredients.